Welcome to Truss Covers USA! Trusswraps™ are the newest creation from designer Bernie Gaps. 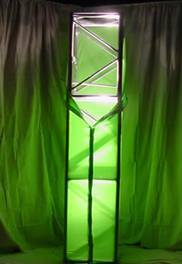 Being in the Special Event industry, he had witnessed many lighting companies struggle to effectively cover aluminum trussing. Worse yet, many trusses were never covered, when they should have been (think beautiful elegant white wedding with bare truss and instruments). Trusswraps™ are typically installed on upright trusses that are mounted on base plates, either individually, or as part of an arch, cube, or other structure. Par cans placed inside create a beautiful glow. These wraps are constructed with machine washable fabric and Velcro™ strips sewn from top to bottom for ease of installation and strike. They are available in black, white, or 15 other colors. Trusswraps™ are single pieces of IFR fabric that are used to quickly (less than 30 seconds) cover standard 12” or 20” box truss. These standard sizes will be available for rental or purchase.